With great sadness I note the passing of Martin Lueders in June 2014. He was an internationally recognized, award-winning freelance photographer, primarily on humanitarian and environmental issues. He was an outstanding photographer, whose photos helped all who saw his work understand human suffering far outside the bounds which most of us have experienced. Hunger Notes was privileged to have his photographs illuminate two of our stories in 2000, War Games and Armed Conflict and Hunger. “A.K., ” an 8-year-old “Kamajoh,” with the Civil Defense Force in Moyamba, Sierra Leone, has been fighting since the age of 6. Kamajohs are traditional hunters of the Mende tribe, who volunteer their service in defending their villages against rebel forces. After going through an initiation ceremony, Kamajohs believe they possess magical powers that deflect enemy bullets. 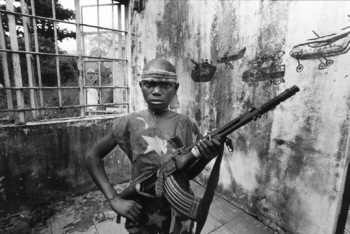 In 1999, Lueders was commissioned by the United States Agency For International Development’s Displaced Children & Orphans Fund to document child soldiers in four African countries for a traveling exhibit and book entitled, “Playing For Keeps: Children & War in Africa”, which includes 36 black & white photographs and testimonies from current and former child combatants. We used seven of these pictures for our story on child soldiers, War Games by Kellie Anderson, where the photos may be seen. One is shown above–the captions are his as well. 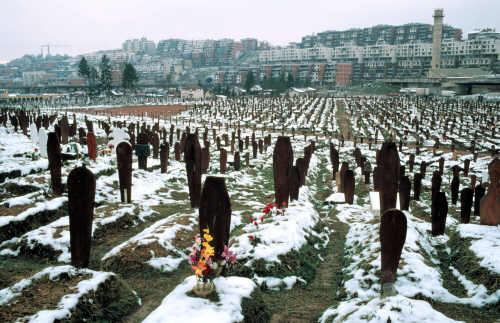 Sarajevo 1997. This cemetery was once a field where people played. At the start of war in the former Yugoslavia in 1992, the Serbian government attacked Sarajevo, the Bosnian Capital. The 43-month siege and artillery bombardment killed civilians, separated families and made daily life a matter of survival. His photographs also illustrated an important article Armed Conflict and Hunger by Ellen Messer, Marc J. Cohen, and Jashinta D’Costa. One of these photos is shown above. His photographs were exhibited and published extensively in the United States and Europe. Lueders’s clients included Greenpeace (International and U.S.A.), Scottish International Relief, the Catholic News Service, Catholic Relief Services and Earth Day. His work was published in many magazines and newspapers including TIME, The Chicago Tribune and the Suddeutsche Zeitung (Munich). Several years ago, a student wrote Hunger Notes asking “how do I save the world?” I didn’t give a very good answer at the time, but the question did stick in my mind. For Martin Lueders, certainly his efforts to change the world for the better involved bravery, compassion, a desire to understand what was happening in often desperate situations, and the skill to communicate what he saw.